As a school community, we begin our day by praying together. Each month a different grade level (K-8) is designated to choose representatives for this honor. Upon finishing our prayers together, the classes continue with special intentions and additional class prayers. At 1:36pm we are lead daily in an examination of conscience, by two eighth graders. This is followed by praying the Act of Contrition. Dismissal prayers may include a reflection, an entry in their Religion journal and/or prayer that is consistent with the current Liturgical Season. O Jesus, through the Immaculate Heart of Mary, I offer you my prayers, works, joys, and sufferings of this day in union with the Holy Sacrifice of the Mass throughout the world. I offer them for the intentions of your Sacred Heart, the salvation of souls, the reparation for sin, and the reunion of all Christians. I offer them for the intentions of our Bishop and all the Apostles of prayer, and in particular, for those recommended by our Holy Father this month. 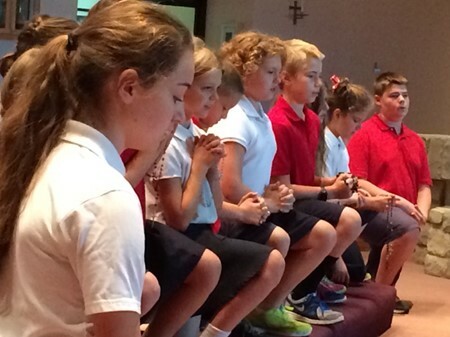 Anchored in faith, belief, and tradition Saint Brendan Catholic School seeks to demonstrate the image and likeness of Christ in academics, spirituality and fellowship within and beyond our school, so that all may come to know Christ through us. "ST. BRENDAN… PRAY FOR US." The angel of the Lord declared unto Mary. And she conceived of the Holy Spirit. Behold the handmaid of the Lord. Be it done unto me according to your Word. And the Word was made flesh. Pray for us, O Holy Mother of God. That we may be made worthy of the promises of Christ. Bless us, O Lord, and these thy gifts, which we are about to receive from thy bounty, through Christ our Lord. Amen. We give You thanks, Almighty God, for all Your benefits, who live and reigns forever and ever. May the souls of the faithful departed rest in peace. (Use the right thumb to make a sign of the cross over the forehead, lips and heart.) May God be in my thoughts, in my words and in my heart. Amen. I am the Lord your God. You shall not have strange gods before me. Remember to keep holy the Lord's Day. You shall not covet your neighbor's wife. You shall not covet your neighbor's goods. may come to know Christ through us."